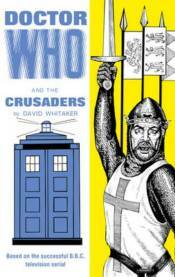 The first Doctor meets Richard the Lionheart in the Third Crusade, in a new fascimile edition of the long out-of-print original 1960s edition. When Barbara is captured by the Saracens and later kidnapped by the monstrous El Akir, Ian appeals to Richard for help, but despite having achieved a splendid victory over Saladin at Arauf the English King has his own troubles and cannot assit. So Ian sets out to rescue Barbara alone while the Doctor becomes involves in the intrigues of the English court.